Sejah Farm’s primary business is raising Boer Goat and Boer Goat crosses for meat and herd improvement. Over the years, Sejah Farm has diversified and added sheep and crop production to its farm enterprise. Diversifying our farm is a means of having more than one source of on farm income and providing the finest possible quality of local meats and produce available for our island community. The U.S. Virgin Islands imports 99% of is raw and processed foods, which account for over $400,000,000 exported annually. Educating our community on the need to buy locally and eat fresh foods is paramount to us at Sejah Farm. 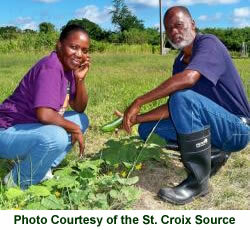 Our islands food security is one which is dear to our hearts. We will continue to advocate and educate farmers and our community to grow, buy, and eat local meat and produce. Developing a local island food system is a challenge. However, it is one that we at Sejah Farm are willing to take on, since it is a part of the islands agriculture resurgence. The territory’s agricultural industry has been without any significant governmental involvement for the last 47 years and it is now slowly changing. Additionally, the need for our community to encourage our farmers by asking them to grow what they want could help deter the need to import certain products. A local island food system development would require; however, looking at the areas which encourage this kind of activity. One is marketing local products, which requires a consistent supplier of any one commodity and making it available to the community on demand.